Thank you so much for having all of this information in ONE place. I have been searching for hours to find a easy to use tracking sheet, and useful information for what scouts can do at home or with family. Thanks so much great information!!! Great, great resource. Thank you for doing! Do you have one for the new program? Do you have an updated page with the New Requirement that need to be done with family? The page numbers on this one do not correspond with anything. VaLayne, how can I help? 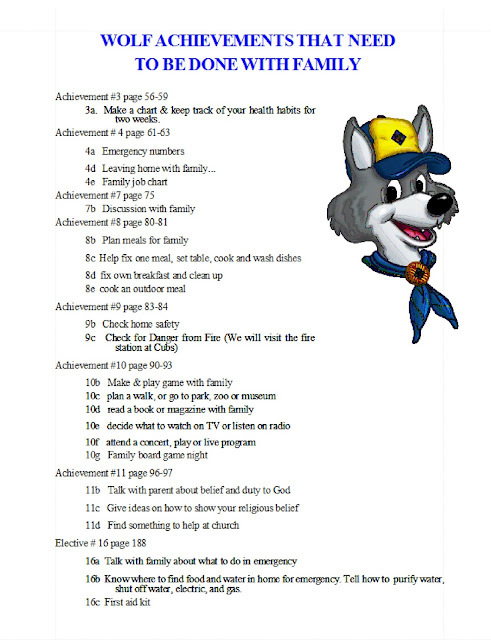 These are requirements your cub scout needs to earn his Wolf Rank. Thank you. I would be willing to help. Are you looking for the ones that are exclusively done with the family?